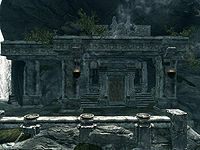 Nepos's House is a luxurious private residence owned by Nepos the Nose, who is a wealthy resident of Markarth. It is located on the third terrace on the northern side of Markarth, next door to Vlindrel Hall, above Endon's House and two terraces above Arnleif and Sons Trading Company. His three Breton servants appear to be very protective of him, especially Uaile, who questions visitors at the door and claims to be Nepos's maid. It is a large single-story property that is lavishly furnished. There are numerous food barrels and sacks throughout the property, along with plenty of fancy cookware. The main room has two stone tables with wooden chairs down the middle of the room, laden with four portions of grilled leeks, a raw rabbit leg, three bottles of alto wine, two bottles of wine, two pheasant breasts, two carrots, two salmon steaks, a salt pile, plenty of loaves of bread, five slaughterfish eggs, many pieces of cheese, two baked potatoes, two seared slaughterfish, a rack of dog meat, a garlic bulb, a red apple, and a small coin purse. There is a dresser with a thistle branch on top against the south wall. To the right, in the southwestern corner, is a round wooden table and two chairs with a large coin purse, a steel dagger, and a boiled creme treat on top. Against the west wall is a cupboard holding a bottle of alto wine, a bottle of wine, a couple of loaves of bread, a sheaf of wheat, and an eidar cheese wedge. To the right of this is an unlocked chest with a set of shelves to its right of that. These shelves hold a bottle of wine, a couple of pieces of cheese, and a green apple. Beside the shelves is a small square table with clutter on top. In the northwestern corner is a door into a bedroom. Along the north wall is a stone bench, a couple of wooden chairs, and a stone shelf holding a loaf of bread. In the northeastern corner is door to another room. Against the east wall is a stone table with a joint of raw beef, a thistle branch, a basket containing a haunch of raw venison and a goat cheese wheel, and another basket containing a cabbage and a sample of fly amanita. To the right of the table is a piece of loose firewood with a woodcutter's axe on top of a food barrel. In the southeast corner is a large fireplace with a pile of firewood to the left. To the right is a goat cheese wheel in a cast iron pot and in front is a wooden chair. Above the wood is a rack hanging from the ceiling holding two rabbits. Against the south wall is a kettle holding a cabbage, a gourd and a potato, with another rack above it holding two salmon, a garlic braid, and a bunch of frost mirriam. The bedroom to the northwest contains two single owned beds both coming out from the north wall, separated by an end table with a bottle of Nord mead on top. To the left of the beds is a chair and against the west wall is a tall wardrobe and a dresser, both containing clothes. On the dresser is a sprig of snowberries and a green apple. There is also a small square wooden table against a wall to the southwest with another green apple and mead barrel on top. Finally against the east wall is a set of shelves holding a flute and drum. Through the other door is a kitchen area in front of you and, on a raised section, another sleeping area. In the middle of the room is another stone table with a wooden chair at either end. On the table is a bottle of alto wine, a portion of grilled leeks, a raw rabbit leg, a seared slaughterfish, a carrot, two loaves of bread, a sweet roll, a honey nut treat, and several pieces of cheese. Behind the table, on the rear wall is a large fireplace with a cooking pot in front. On your right as you enter, on a stone shelf is an apprentice-locked display cabinet with an enchanted steel dagger. The display cabinet can be unlocked with the key to Nepos's House which is carried by all the residents. Against the east wall is a set of shelves holding a bottle of alto wine, a bottle of wine, a draught of extra magicka, a rock warbler egg, a couple of pieces of cheese, and a potato in a cast iron pot. To the right of the shelves is a wash basin and beside this on the floor is a basket containing two cabbages and several potatoes. In the northeast corner is a small square stone table with a bunch of lavender and an unlocked chest, with a basket under the table containing two gourds and a potato. At the western end of the room are stairs up between two shoulder-high walls, to the raised section. On the partition walls is a bowl containing an empty greater soul gem, a set of fine clothes, and a wooden bowl containing five gold coins. On the raised section are two owned beds; the first coming out from the south wall is a single and the other coming out from the west wall is a large double. To the right of the single is a tall wardrobe with a pair of fine boots to the left of it and in an open crate, on top of another crate are four silver ingots. There are end tables on either side of the double bed. On the left-hand one is a copy of Of Fjori and Holgeir with a stone shelf to the left holding three more common books and a copy of the Illusion skill book The Mystery of Talara, Part 4. On the right-hand end table is a fine hat and two gold coins. Higher up on the north wall is an easily-missed shelf with a silver ingot and medium coin purse, and a wash basin further to the right on a stand. There is a "Loot" shadowmark to the top right of the entrance door. The two unlocked chests do not respawn. This page was last modified on 17 May 2015, at 10:29.